My mom finally made an appearance in a video! Watch her make our family’s recipe for Spanakopita. Such a staple in our family for special occasions! Mmm so delicious. 1. Mix together the spinach, feta, goat cheese and eggs. 2. Melt the butter. To start the layering process, brush some butter on the bottom of a 9×13 tray. Place a single layer of phyllo. Butter every layer. Make sure you have a good brush so you don’t have to worry about any hairs coming out when you’re brushing the butter. Use 8 layers of phyllo, then add 1/3 of the spinach mixture. Spread with a spoon, or your hands, like mom! 3. Add 5 more layers of phyllo and another 1/3 of the mixture. Don’t forget to brush butter between every layer. Add another 5 layers and use the rest of the spinach. Top with however many more pieces of phyllo you have left, about 5-8. Brush the top with butter. Cut in squares. Much easier to cut before you cook it. Then place in a 375 degree F oven for 45 minutes, or until the top is a beautiful golden brown. Let mom, grandma and I know if you make it! Share if you loved this post! 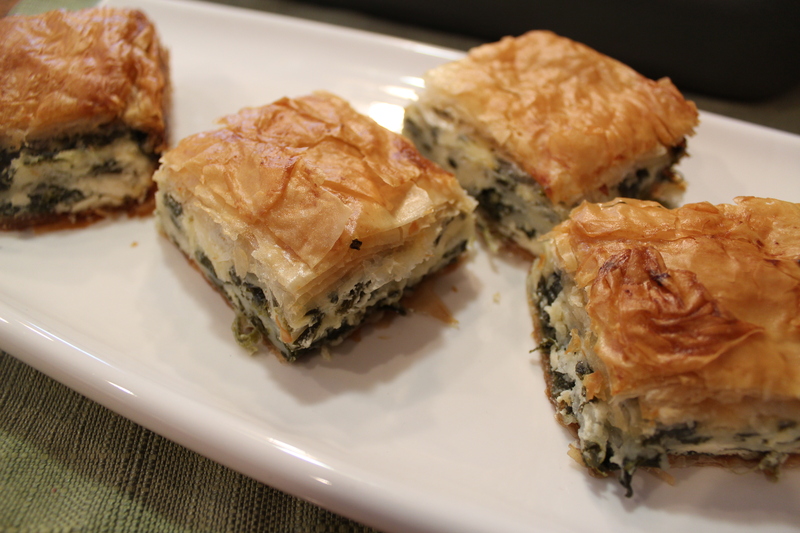 This entry was posted in food, how to, recipe, tutorial, video and tagged appetizer, greek food, greek recipe, greek spinach pie, how to make authentic greek spinach pie, how to make spanakopita, how to make spinach pie, recipe, spanakopita, spinach pie by classycookinwithchefstef. Bookmark the permalink. Love Spanakopita and your recipe as well. Well done to your mum. My wife makes the spanakopita I have ever tasted but I am prepared to try yours. Will be making this for Christmas party! Can’t wait!! Thanks for the recipe!! I’ve made this recipe twice now and expect to do so again many times in the future. My family loves it and it’s fairly quick to throw together. Thank you so much for posting! I just made a batch (reduced the recipe to half)! It’s so good!!! Thanks for sharing! However, one question. How long does it last in the fridge? Can I freeze it? thanks! Can this be made the night before and baked off the next day? Made this tonight and was amazing. I just added some onions, garlic and dill and kept the rest of the recipe the same. Amazing, this is a keeper! YES!!! So happy to hear!!!! Send a pic! Awesome recipe! Simple yet perfectly explained! Adding to my go-to list. Does anything need to be done with the spinach before adding it to the other ingredients? Such as being thawed or drained? I’m very excited to make this dish. It’s going to be an appetizer at my parents anniversary dinner. AWESOME!!!! So happy to hear!! I made this recipe for my daughter’s 17th birthday party back in November. Spanokopita, Greek potatoes, Bouzouki music, everything! We were all Greek for the night! The recipe is absolute PERFECTION and we are making it again tonight. We have a wonderful, locally famous, Greek restaurant nearby and everyone bragged about how this Spanokopita was as good (or better 🙂 than theirs! Thank you for this simple, yet superb, recipe! We love it.